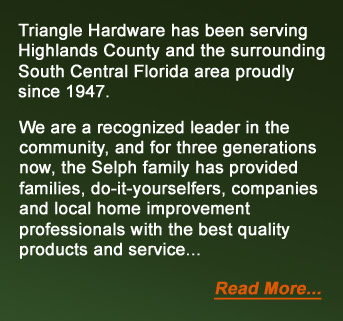 Triangle Hardware - Serving Highlands County since 1947! 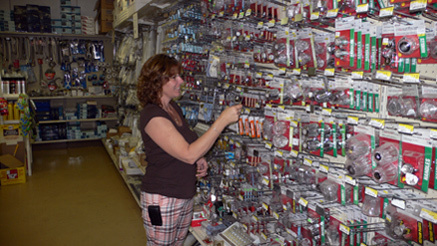 Established in 1947, Triangle Hardware is celebrating 64 years of service in Highlands County and the surrounding South Central Florida community. For three generations we’ve thrived through good times and bad, and today, we have thousands of friends and customers. On behalf of Daniel and Chris Selph and everyone at Triangle Hardware, we would like to take a moment to thank our many loyal customers for their continued support. As times have changed, Triangle Hardware has continued to provide exceptional customer service and bring the best quality hardware, supplies, tools and material to area homeowners, do-it-yourselfers and professionals.